Meetings in February, March and April gave Troop 50 Scouts the opportunity to learn some practical skills to use around the house, as well as to make progress toward earning two merit badges — Automotive Maintenance Merit Badge and Home Repairs Merit Badge. Both merit badges demonstrated to Scouts that they could help save their families money by performing home and auto tasks themselves instead of paying someone else to do them, or repairing items that might otherwise be thrown away. Assistant Scoutmaster Jason Smith gives Scouts an overview of automotive maintenance. Over two meetings on Feb. 26 and Mar. 5, Scouts looked under the hood at the requirements for Automotive Maintenance Merit Badge. 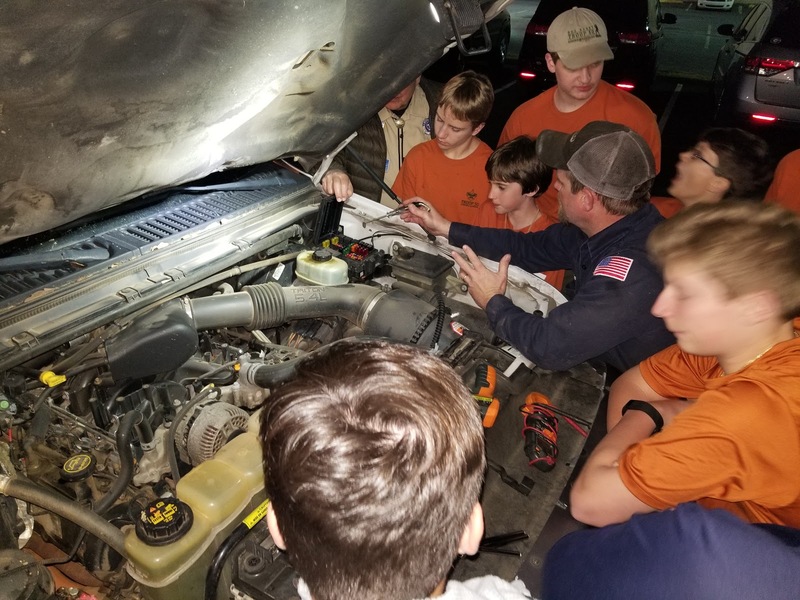 With the help of Assistant Scoutmasters Jason Smith and J.P. Pendleton, Scouts learned their way around the parts of the engine, as well as ways to ensure their safety — and that of their cars’ — while maintaining them. They learned about the importance of following the manufacturer’s recommended maintenance schedule; an automobile’s various systems; and how to check fluid levels and the wear and tear of vital engine components. Assistant Scoutmaster Wes Williams explains to Nicky the basics of a gravity toilet. Lead Troop Guide Jacob supervises Boone's use of a soldering iron. On Apr. 9, Scouts again rolled up their sleeves to learn how to tackle common household repairs through an introduction to Home Repairs Merit Badge. Scouts visited stations where they learned how to repair household items like lamps, extension cords, toilets, garden hoses and towel rods, as well as use a soldering iron and caulking gun. Scouts interested in pursuing these merit badges were encouraged to speak with a leader or work with their parents independently. Both merit badges also demonstrate how parents with varying skill levels ranging from that of a professional to a simple hobbyist can be part of the troop’s advancement efforts by helping to teach a merit badge. The troop’s online photo album contains more photos from both our Automotive Maintenance Merit Badge and Home Repairs Merit Badge meetings.